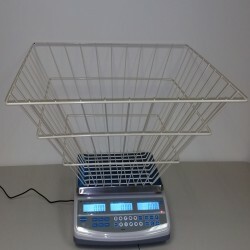 The Brecknell PC60 Series laundry scale is a highly accurate and dependable NTEP legal for trade price computing scales that feature front and rear viewable displays. 60 lb capacity. AC or battery power. Heavy duty wire laundry basket allows you to easily charge customers clothes by the pound. 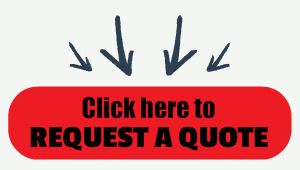 The highest quality at the lowest price is the Brecknell way. Seeing the name Brecknell on a high-quality price computing scale like the PC60 should come as no surprise. What will surprise you is the remarkably affordable price. 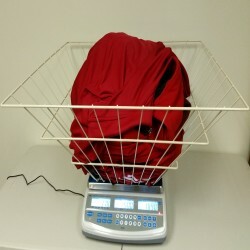 With the PC series, Brecknell Scale has taken weighing technology to a new level to offer an unbeatable package to Laundromats everywhere looking to charge customers clothes by the pound. The scale, available from Central Carolina Scale, is constructed of ABS plastic with adjustable leveling feet and built in leveling bubble. The operator keys are Tare, zero, unit conversion, 6 direct plu's, 50 indirect plu's, X2, X4, and clear. The displays show unit weight, unit price, and total price. The backlight is programmable for power saving. 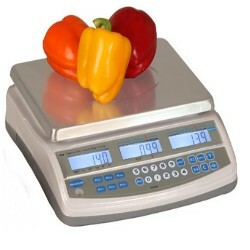 The scale displays weight in kilograms, pounds and ounces. Trade approved capacities for any application such as charging your laundromat customers by the pound. The PC series delivers the capacity and resolution you need. NTEP CoC #11-116 Class III legal for trade approvals to suit the state inspector. This scale even shows weight and prices in ounces and kilgrams too. 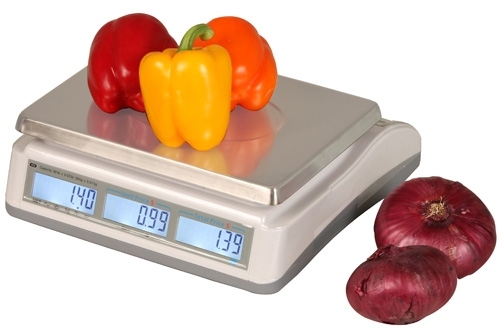 The PC60 scale has a 960 oz capacity and readability of 0.5 ounces. The scale operates on standard AC power or the built in rechargeable battery which has a standard operating time of approximately 70 hours without backlight or about 35 hours with backlight. The 11.8" x 9" platter is a high quality stainless steel material. The standard operating temperature that the manufacturer recommends is 14° F to 104° F.
The PC series gives you the power to use your scale in most trading situations, by offering a choice of AC or battery power standard. Take advantage of the internal rechargeable battery, and the PC series is instantly portable.